In the comic book legend of Superman, an occasional ingredient in the story is the caped one’s ice cave, the Fortress of Solitude, usually located somewhere up near the North Pole. In the movie series, Christopher Reeve created this via a dense Kryptonian crystal, possibly a sun-stone sent to Earth with the escaping infant child by Superman’s father, Jar-El, as played by Marlon Brando. This super-concentrated nano-crystal contained all the knowledge and memories of the Kryptonian race, to enable Superman to reach his full potential. 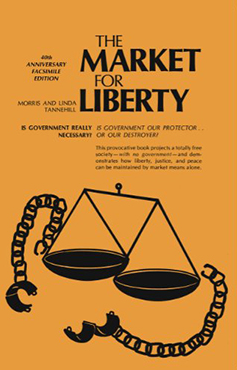 And in many ways, The Market for Liberty, by Linda and Morris Tannehill, originally published in 1970 and now re-published by Laissez Faire Books, is a similar kind of nano-crystal sun-stone, containing virtually all the light required to form a complete global society free from the parasitical and metastasizing carcinoma virus of peace-destroying, wealth-destroying, and liberty-destroying government. To provide a solid roadway into freedom I would normally recommend that a bolstering literary canon should include Ludwig von Mises, Murray Rothbard, Bruce Benson, Ayn Rand, George Orwell, and Hans-Hermann Hoppe. If, however, you want the whole freedom rush in one hit, this book could provide that super-dense Cuban cigar. Take a look at this typical quote from the book. If that seems a little simplistic, some firm meat backs it up. The first part of the book, labelled The Great Conflict, consists of a kind of Rothbardian-Randian soup, all compressed into a handy travelling cube, with plenty of motivational herbal notes along the way, such as this one. This first part is the best section of the book, flowing along beautifully like a wild canyon ride. After this poetry, we then towel ourselves down for some serious prose by progressing into part II, labelled A Laissez-Faire Society. Here, the authors dissect the Benson-Hoppe areas of competitive security production. We begin with straightforward fare. However, virtually every question a devil’s advocate minarchist could think of is tackled by the Tannehills in their quest to prove the unnecessity of the state. However, as others have noted before me, the ‘Randian’ nature of the book does lead to what I would consider a slip-up on the ‘intellectual property’ front. This perhaps marks the book’s first slight Achilles Heel. Another distraction might appear to those already initiated with the Bensonian and Hoppeian ideas proclaimed – the justifications on how a truly free society will solve its security problems start to become relentless. In wave after wave the book prescribes how the free market will solve the problems the state claims to solve now, mostly related to justice, peace, and security (all three of which the modern state lamentably and quite clearly fails to solve). However, although this forensic detail provides great ammunition for those who might occasionally find themselves trapped inside otherwise intractable arguments with minarchists – when perhaps they could be relaxing with a glass of pinot noir instead – we actually lack any real detailed clarity on how a free society will work once we take our freedom back from the state. Could you predict from the outset how undirected biological evolution would progress in a complex free environment in the light of continual and unpredictable environmental change? Farmers try to tame, control, and direct evolution to satisfy their own personal needs, just as tax farmers do the same with society. But the minute a farming whip hand gets removed, nature and society quickly re-assert themselves into axiomatically-ordered chaos. If evolution holds a combined nature of spontaneous chaotic unprediction based upon an axiomatic scientific framework of nucleic acid replication, then why would societal freedom be any different? The purpose of Austrian economics lies in mapping the axiomatic nucleic acid of society. Alas, how any isolated society will evolve once free of criminal restriction will never resolve itself entirely from the entrepreneurial fog of speculation. That’s the beauty of both freedom and evolution, an intimate pair of development strands twisted together as related, spontaneous, and complex-chaotic processes. Both perform optimally to produce the greatest order when free to go whichever way they perform best given the changing and tangled environment in which they exist from moment to moment. Yes, the underlying frameworks of Austrian economics and nucleic acid replication ultimately provide ever-evolving order in both systems, but mapping out the future too closely can harm the reputation of both successful entrepreneurs and successful evolutionary scientists. Having said all that, if you are a reluctant minarchist and you need some help, persuasion, and plausible ideas, to come to over the light side, this may just be the ideal book to bring you over a possible Stockholm-syndrome chasm of a vestigial emotional connection to a gang of bandits called government which has preyed upon your life’s energy output from birth. Think Matrix. Think red pill. The metaphorical call to man the barricade then comes in part III, labelled How Do We Get There?, which says what you might expect about privatisation, taking ownership of your life, and rejecting government wherever you can. One interesting trumpet note here leads the Tannehill charge, going beyond Rand or even Murray Rothbard, which is a call for the U.S. dollar’s replacement by something private people can transact safely and securely. Although they detail the importance of gold and silver as money, they believe it may take a while for these precious metals to fill any void left by the dollar’s ultimate and probably sudden collapse. I was particularly struck by the end of this line, first written and published 43 years ago. Shades of Bitcoin anyone? It truly is a remarkable book, decades ahead of its time, and still highly useful today. Once you’ve swallowed the Tannehill pill, prepare to throw away your Union Jack cufflinks, your Swedish flag backpack, and your Tricolour underwear. See why this book helped convert Doug Casey to the reality of true freedom. At least, that’s what it says on Wikipedia, and as that wonderful Internet source of information drew its inspiration directly from the ideas of Hayekian spontaneous order, who are we to argue? You may also learn to feel the aspiration – no matter how long it takes to arrive – of a totally voluntary society, whether this society discovers itself on Earth, which I personally consider unlikely, or whether it first materializes out there on the upcoming frontier of space. This may be a territory, an island, an asteroid, a moon, or a planet of super men and super women who have risen above the tax farming propaganda of criminal gang states via the inspiration of books like The Market For Liberty. Perhaps we should therefore call this first free place Krypton? Or as our Bitcoin-supporting friends might spell it, Crypton. Though I would be happy for it to be called ‘Virgin Gulch’ or ‘Red Bull Field’, or named after whichever other private organisation first founds this magical place to reboot human progress after the disastrous 10,000 year experiment of the state. After all, who am I to predict which company of free men and women will get there first and what they’ll call it? Though it would be really good if this first free city were named ‘Euro Vigilante Haven’. That really would be quite a place.